Minute Maid Park is the site of the matchup between the Los Angeles Dodgers and the Houston Astros on Saturday, October, 28, 2017 in Game 4 of the World Series. The probable starting pitchers are Alex Wood for the Dodgers and Charlie Morton for the Astros. Los Angeles opens at +102 while Houston opens at -112. The Dodgers have a 69-82-11 over/under record and a 78-84-0 run line mark. The Astros are 90-85-0 against the run line and have a 88-78-9 over/under record. The Dodgers have a 104-58 overall record this season. Starting pitcher Alex Wood has a 16-3 record with an earned run average of 2.72 and a WHIP of 1.06. He has 151 strikeouts over his 152.1 innings pitched and he's given up 123 hits. He allows 7.3 hits per 9 innings and he has a FIP of 3.32. The bullpen has an earned run average of 3.38 and they have given up 463 base hits on the year. Teams are hitting .220 against the bullpen and they've struck out 637 hitters and walked 183 batters. As a team, Los Angeles allows 7.6 hits per nine innings while striking out 9.6 batters per nine innings. They are 2nd in the league in team earned run average at 3.38. The Dodgers pitchers collectively have given up 1,226 base hits and 543 earned runs. They have allowed 184 home runs this season, ranking them 25th in the league. Los Angeles as a pitching staff has walked 442 batters and struck out 1,549. They have walked 2.8 men per 9 innings while striking out 9.6 per 9. They have a team WHIP of 1.16 and their FIP as a unit is 3.67. As a team Los Angeles is hitting .249, good for 22nd in the league. The Dodgers hold a .437 team slugging percentage and an on-base percentage of .334, which is good for 8th in baseball. They rank 23rd in MLB with 8.3 hits per game. Cody Bellinger is hitting .267 with an on-base percentage of .352. He has 128 hits this season in 480 at bats with 97 runs batted in. He has a slugging percentage of .581 and an OPS+ of 142. Yasiel Puig is hitting .263 this year and he has an on-base percentage of .346. He has totaled 131 hits and he has driven in 74 men in 499 at bats. His OPS+ is 118 while his slugging percentage is at .487. The Dodgers have 1,347 hits, including 312 doubles and 221 home runs. Los Angeles has walked 649 times so far this season and they have struck out 1,380 times as a unit. They have left 1,146 men on base and have a team OPS of .771. They score 4.75 runs per contest and have scored a total of 770 runs this year. Houston has a 101-61 overall mark this year. With an earned run average of 3.62, Charlie Morton has a 14-7 record and a 1.19 WHIP. He has 163 strikeouts over the 146.2 innings he's pitched. He's also given up 125 hits. He allows 7.7 hits per nine innings and his FIP stands at 3.46. The bullpen has an earned run average of 4.27 and they have given up 485 base hits on the year. Teams are hitting .232 against the Astros bullpen. Their relievers have struck out 662 batters and walked 213 opposing hitters. As a team, Houston allows 8.2 hits per nine innings while striking out 9.9 batters per nine innings. They are 11th in the league in team earned run average at 4.12. The Astros pitchers as a team have surrendered 1,314 base knocks and 662 earned runs this season. They have given up 192 home runs this year, which ranks 20th in Major League Baseball. Houston as a staff has walked 522 hitters and struck out 1,593 batters. They give up a walk 3.2 times per 9 innings while they strike out 9.9 per 9. Their team WHIP is 1.27 while their FIP as a staff is 3.91. As a team, they are batting .282, good for 1st in the league. The Astros hold a .478 team slugging percentage and an on-base percentage of .346, which is good for 1st in baseball. They rank 1st in MLB with 9.8 hits per contest. George Springer comes into this matchup batting .283 with an OBP of .367. He has 155 hits this year along with 85 RBI in 548 AB's. He maintains a slugging percentage of .522 with an OPS+ of 145. Marwin Gonzalez is hitting .303 this season and he has an OBP of .377. He has collected 138 hits in 455 at bats while driving in 90 runs. He has an OPS+ of 150 and a slugging percentage of .530. The Astros as a unit have 1,581 base hits, including 346 doubles and 238 homers. Houston has walked 509 times this year and they have struck out on 1,087 occasions. They have had 1,094 men left on base and have an OPS of .823. They have scored 5.53 runs per game and totaled 896 runs this season. 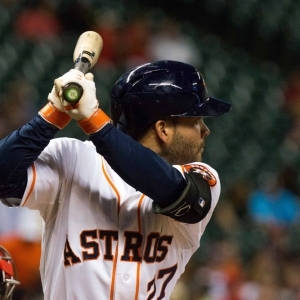 Who will win tonight's Dodgers/Astros MLB game against the spread?